This discussion is an outgrowth of Paul Hoffman’s recent piece “The Trouble with Race Walking”. He facilitated this discussion between Jeff Salvage, athlete, educator, and founder/publisher of racewalk.com, and Margo Schulter, a freestyle athletic walker, advocate, and writer. Sports in general are governed by many rules and definitions. Often outsiders looking in could suggest they seem to be picked arbitrarily. Why is basketball’s shot clock 24 seconds or the distance between first and second base 88 feet? Race walking is no different. Technically there are many rules and a two part definition. The rules are not usually controversial in their nature; i.e. you cannot aid a competitor by giving them a lift in a car during the race. However, the definition of race walking is surrounded by controversy. The purpose of the definition is to separate race walking from running. Over the years the definition of race walking has changed quite often to reflect the times. In the early more distinguished era of walking competitions, the definitions of walking focused more on clothing than biomechanics. The current definition, as stated by USATF (USA Track and Field) and IAAF (International Association of Athletics Federations), focuses on describing race walking so that it best represents the difference between race walking and running given the current state of technology. Controversy surrounds both portions of the definition. Some proponents would like to remove the straightened knee portion of the rule entirely. Others wish to define it with more proper biomechanical terms. I will steer clear of these debates and focus on the loss of contact portion of the definition. To understand what the implications of the first portion of the definition are requires understanding the context in which it is applied. Someone made up the rules and umpires and referees enforce them. For years the definition of race walking stated in some manner that one foot must always be in contact with the ground. Indeed when I learned to race walk this was the stipulation. However, even back then, most people involved in race walking suggested that most elite walkers did not maintain absolute constant contact with the ground. The consensus was there was a brief and undetectable moment when an elite race walker had both feet off the ground. As a very legal looking race walker myself, I have pictures of myself walking in the low 7 minute per mile race for 20km’s where the photographic evidence showed me with a double support phase, meaning for an instant both my feet were in contact with the ground simultaneously and I had no flight phase whatsoever. Remember, these were the days before the proliferation of digital cameras and thus the influx of hundreds of thousands of crowd sourced photographs. It was also the days before video cameras were capable of taking footage at speeds of 1000 frames per second. Quality photographs were a luxury and capturing stills from video was at best a fuzzy endeavor. When we looked at video tape, we used to concede that as long as a walker wasn’t off the ground for more than one frame, they were legal. In the mid 1990’s as camera technology improved, more and more elite walkers were caught off the ground in slow motion playback and still photography. The problem was that if you were watching a race walker with a flight phase of less than 1/30th of a second, the human eye couldn’t pick it up. Further technology wasn’t the answer. Although there was talk of creating a run alarm, similar to detecting a touch in fencing, no viable system was created. There were issues of reliability, cost and distribution. Even if one were created, it would create a consistency problem. At what level would competitors be required to wear an “alarm?” One of the beauties of race walking is that any athlete in any country can train for it. It’s not by coincidence that race walking champions have come from characteristically under represented countries to the podium. Recent champions have stemmed from Poland, Ecuador, Mexico, Greece, Spain, Slovakia, Kazakhstan etc. Adding technology presents a great risk to the balance in the sport. The definition was therefore modified in 1996 to reflect the spirit of what transpires on the track/road. In practicality it should have changed nothing. To state “to the human eye” is merely a clarification. If the event is judged by people and not machines, then how does adding the phrase “to the human eye” change anything? Note that at the same time “to the human eye” was added, the straightened knee portion of the rule was also changed and made stricter. The debate about adding the phrase “to the human eye” is derived from the concept that rules shouldn’t be subjective. However, most of our sports are based on very subjective rules subject to the human eye. Paul Hoffman points out in his post the breast stroke in swimming as the rare example. Along those lines, trotting in horse racing has the same issue. The reason these sports have issues is because style is part of the rules. However, sports rules subjectivity doesn’t end there. Football, baseball, and basketball all have highly subjective “to the human eye” components. While their rulebook may not state “to the human eye,” by allowing instant replay on some issues and not others creates a tacit implication that “to the human eye” is the rule of law on the non-reviewable plays. Football doesn’t check the proverbial video tape for holding calls. Neither for that matter does basketball. Baseball could easily call balls and strikes using technology, but instead they choose the human’s ever moving strike zone that is loosely defined. The problem with race walking’s definition isn’t the definition; it’s the interpretation and training of the judges. Science could and should define what “to the human eye” means. The consensus amongst my peers is somewhere between 1/30th and 1/50th of a second. If we use the more generous value of 1/30th of a second, then judges should be trained to recognize the distinction between walkers with a flight phase of less than 1/30th of a second versus over 1/30th of a second. Using high speed video, exams could be determined that test definitively whether a judge’s disqualification calls mirror reality. Instead, the highest level of judging in the world, the IAAF, uses a popularity test with no basis in science to determine what the correct answers to the video test for judging are. The result is a wildly inconsistent evaluation of race walking illegalness. Changing the definition back so that “to the human eye” is not included increases subjectivity and encourages judges to look for other signs that a walker is off the ground. These include bobbing heads, high knee drives, and other extraneous motions. If instead judges are trained more scientifically and spectators are educated to the meaning and implication of the rules, race walking would be just fine. It’s a great pleasure to join in this dialogue with Jeff Salvage, a world-class athlete, scholar, and scientific investigator of modern race walking. Whatever "outsiders looking in" may think, this is mainly a family discussion among people devoted to various styles of athletic walking: "Which styles should be legal in which events within our discipline?" As in the discipline of swimming, so in walking, the reality of "different strokes (or strides) for different folks" naturally leads to a range of recognized styles or techniques, event types, and rules. Greater diversity can make walking a more accessible and thriving discipline of track and field, with events under the current 1996 rules as part of the mix. Athletic walking should be a beautiful gaited horse with many paces and styles, not a one-trick pony limited to a single gait, however impressive or meritorious. It’s a brute fact of physics that any form of really fast competitive walking done by humans on the Earth’s surface will involve some of the biomechanical incidents or techniques of running — in a straight-knee or bent-knee style, and quite apart from any legal or illegal flight phase that might occur! Froude’s Law sets a limit of around 10 km/h or 6 mph (a 10-minute per mile pace) for natural or "inverted pendulum" walking. Different walking styles and rules incorporate some features of running while excluding others, and sometimes also excluding a natural, everyday, walking gait. But no one is pure and pristine who goes beyond or outside the limits of brisk street walking: not people walking under the 1996 rules nor, for example, those of us training or competing under rules strictly excluding a flight phase but otherwise permitting any technique. To say that style rules like those adopted by the International Association of Athletic Federations (IAAF) in 1996 "separate race walking from running" is rather like saying that the rules for the breaststroke "separate swimming from running." Indeed they do, while additionally separating the breaststroke from other forms of athletic swimming: e.g. the backstroke, or the crawl favored in freestyle. Likewise, the 1996 race walking rules define one type of walking event and set it apart both from ordinary running, and from various other styles of race walking illegal under these rules, but legal under earlier IAAF rules adopted at various points in the 20th century. The 1996 rules, like the breaststroke rules, describe one athletic style or fashion, not the totality of walking or swimming! Very simply, the 1996 rules legalize something strictly excluded by earlier IAAF walking rules: an aerial or flight phase, where both of the walker’s feet leave the ground at the same time. Traditionally this is known as the technical fault of "lifting," but the 1996 rules make it legal as long as the artful optical illusion of continuous contact with the ground is not clearly broken, as judged by the human eye in real time. To compensate for this artistic liberty, the rules set very strict limits on knee action, excluding a vast range of walking forms as well as ordinary running — just as the breaststroke rules exclude other forms of swimming. Imagine a breaststroke race where slow motion videos reveal that the athletes — quite legally! — are covering something like 135 meters of each kilometer by jumping out of the pool for very brief periods and running on the deck! That is about what the 1996 race walking rules authorize, with flight phases often just at the threshold of realtime visual perception, say 0.030 or 0.040 seconds. This compares with an aerial phase on the order of 0.115 seconds for a marathon runner such as Kara Goucher whose style tends to stay "close to the ground." As far as the 1996 rules defining "the difference between walking and running," let’s consider the situation of an athlete at the 35 km mark of a 50 km race walk who adapts Jeff Galloway’s run/walk strategy to her situation. She takes a normal walking break at 6 km/h or 4 mph, a pace of 15 minutes per mile. As someone maintaining perfect contact with a natural human "inverted pendulum" gait where the body’s center of mass (CoM) is highest at midstance with the support leg near the vertical position, she is the very paradigm of a walker in either a classical definition (continuous contact) or a biomechanical one (inverted pendulum technique). Her race walking competitors, as shown by Italian champion Gaspare Pavei and his colleagues, are using a gaitcloser to running in that the CoM is lowest at midstance and highest at double support (the brief phase when both feet are on the ground) <see http://air.unimi.it/handle/2434/208061>. Also, these walkers might be off the ground for brief periods. Guess who gets disqualified? This makes sense as a matter of style: using a natural walking gait in an event under the 1996 rules is like swimming the backstroke for part of a breaststroke race. As an effort to distinguish walking from running, however, these rules would be rather like a legendary Emperor in his New Clothes who orders almost everyone in the crowd arrested for indecent exposure. Correctly noting that race walking style in the late 20th century had already evolved to the point where "top-flight" competition was more than a metaphor, Jeff asks: How did the 1996 rules "change anything"? The answer is that they changed the ethical bounds on what kind of technique a walker may deliberately cultivate while playing by the rules, as a real-life conversation from the year 2000 may illustrate. In a practice session, an outstanding contender managed to walk 3000m in 12:17, with a video showing flawless contact and a true double support phase. His contact was as solid as if he had been "glued to the track." Pre-1996, we could simply congratulate this walker for full legality at 14.6 km/h or 9.1 mph — about a 6:35 per mile pace! A prominent race walker responded, however, by asking "Shouldn’t there be a slight flight phase," and adding that it would be "legal, if not perceptible to the human eye, and should provide an advantage." When someone raised an ethical question, this walker replied: "The rule does not say that you should have a double support phase. The rule says that a walker must appear to have one foot on the ground to the human eye. It doesn’t say you must. I do not see it as a morality issue. When the old rule was in place, I advocated walking with a double support phase. We should walk within the rules." Of course, that prominent race walker was right: if you’re competing under the 1996 rules calling for the optical illusion rather than necessarily the reality of continuous contact, then it’s quite ethical deliberately to cultivate a flight phase. And there’s nothing inherently immoral about a special kind of walking event favoring a very subtle aerial gait, combined with knee restrictions which make the technique in one sense "a purer walking than natural walking." This form, like the breaststroke or any artistic style, should continue to thrive and evolve in its own way. However, why not also have a different kind of athletic walking event where someone able to walk 3000m in 12:17 with true double support could compete under rules favoring that technique, and allowing walkers to flex their quadriceps and their imaginations by exploring the bent-knee styles excluded by the 1996 rules? Walking is progression by steps so taken that unbroken contact with the ground is maintained. At each step, the advancing foot must make contact with the ground before the rear foot leaves the ground. This rule permits a vast variety of human gaits, ranging from brisk normal walking and classic heel-and-toe styles to various bent-knee shuffles and "jog-trots" — but all meaningfully distinguished from ordinary running by the absence of a flight phase. And make no mistake: Usain Bolt couldn’t run 100m in 9.58 seconds, nor Michael Johnson 200m in 19.32 seconds, without benefit of a flight phase! The challenge is to see how fast we can be while maintaining continuous contact with the ground — in contrast to the runner’s air travel. The contact rule, with its requirement for a true double support phase, could be enforced by judges using a standard like that of the UK rules for Centurion events where people walk 100 miles in 24 hours: "[I]t will be up to the walker to demonstrate continuous contact!" Ideally, the judges will use tools such as video replays or shoe devices to help them make more accurate and informed decisions, as Moulinet suggests — but always with humans in the loop. We must judge a "progression of steps" rather than an isolated stumble caused by an unexpected obstacle on the course or the need to swerve and avoid a collision with another competitor, etc. Video requires human interpretation, but that is no reason not to use it, as it has long been used in training and coaching. In my view, we need a less blunt instrument than disqualification to address the technical faults that inevitably occur when athletes press their technique to the limits of the rules — and sometimes overstep the bounds. Time penalties or "tariffs" proportioned to the degree of the fault, the walker’s degree of intention, and the advantage gained are a good alternative. Disqualification could be reserved for unsporting conduct: outright running between judges, deliberately cutting a course short or interfering with the progress of another walker, and so on. In a race, a good straight-leg walker will invariably beat bent-leg walker of the same fitness level — [as] long as the bent-knee walker doesn’t cheat and add a flight phase into his stride. Flying off the ground with bent knees is no longer walking — it’s running! Whether or not Viisha Sedlak’s hypothesis about which style is fastest holds up in practice, her intuition that "flying off the ground" changes the nature of the game is something that many walkers very much share. My one friendly amendment would be to replace her verb "cheat" with "go faster than his technique allows," which any of us might do without any unethical intent. In events under the 1996 rules, of course, "flying off the ground" in a way that doesn’t cross the threshold of a judge’s visual perception isn’t a technical fault at all, much less "cheating" — it’s playing by the rules! Let’s keep the 1996 rules for the events they govern, but also have Freestyle Walks, including Moulinet’s epic 100 km Olympic event as a living laboratory for new walking techniques, race strategies, and methods of judging using video and other technologies to assist the human eye and mind in reaching the most fair and accurate decision. Our discipline will be the winner. Reading Margo’s well thought out rebuttal sheds light on our difference in opinion. Personally, I am not looking to expand race walking so that different forms of walking are incorporated into track and field. We have a great difficulty fielding complete teams in international competition as it is. To further dilute the field into more events we increase our difficulties. Should we add backward walking next? My friend, after not cracking into the elite race walking world, actually tried that! Race walking has long tried to expand by reaching out to health walkers, power walkers, etc and have not had great success in producing any kind of movement there. So the focus of this discussion seems to stem from motive. I desire a single competitive sport called race walking. As to what race walking is, it is important to discuss it biomechanically. The current rule discusses straightening the knee. This is different that straight-knee walking as one describes an action and the other describes a condition that is ambiguous. What does a straight knee mean? If one takes the strict interpretation of Froude’s Law as suggested, then there is no race. Everyone would walk 10 km/h and there would be one giant pack of race walkers. A trained athlete can easily maintain 50km at this pace, even with a moment of double support. So where is the race? That said, I am pretty sure I can race walk faster than this and maintain contact. Margo herself sited an example of a race walker maintaining contact at sub 7:00 per mile. So how exactly does Froude’s law hold up practically in this situation? I strongly disagree with Margo with the statement relating my comparison of running and walking being the same thing as a comparison to walking and swimming. Running and walking are both forms of ambulation. Just as the breaststroke and freestyle are forms of swimming. Any rule change obviously sets it apart from all events that came before it. Rule changes in other events/sports occur all the time, but we still consider it the same event/sport. The rule change doesn’t change anything from a practical point of view unless we employ technology. A debate on using technology is reasonable. I don’t buy the ethical argument. If anything, changing the rule made walkers more ethical. Most elite walkers do not intentionally cheat. They don’t increase their flight phase when out of site of a judge. Since we can’t tell the difference between walkers with a double support phase and a slight flight phase without technological involvement, the change of the rule simply synchs reality with the text. As stated before, added technology creates a financial burden that race walking can’t support. Suggesting we use video replays and shoe devices is completely impractical. I’ve analyzed a lot of video. There is no practical way to use video to ensure constant contact throughout a race. Other technology hasn’t been developed and tested. So that leaves us without technological help. Tariffs have been proposed before. They would be way too hard to employ practically. Does the walker go in a time out or have it assessed at the end. The former is impractical, the latter creates chaos at the finish line. How many people in front of you are actually behind you? If we expanded to 100 km events as the primary events for race walking, we will have even less organizations willing to host events and far fewer participants in the event. The amount of time necessary to train would kill what’s left of our event/sport. First, let me join Jeff in emphasizing that we are expressing different points of view about walking rules and events, not about the ethical integrity and dedication of the walkers, coaches, and judges who strive for fairness and excellence under those rules. Jeff has very honestly and ably advanced the views of what might be called the select gaited community of race walkers. His questions help me clarify the inclusive approach I advocate for our discipline of walking, at all levels up to and including the Olympics. First, let’s get our athletic disciplines straight (swimming, walking, and running), and clear up the matter of walking styles and events. Swimmers travel through the water; walkers travel by land, always maintaining continuous contact with the ground; and runners travel by land and air, typically having a portion of each step where both feet are off the ground — they don’t call it a "flight phase" or "airborne phase" for nothing! The option in running to lengthen one’s stride with a flight phase or "air travel" is what distinguishes it from walking. Freestyle walkers simply seek to go as fast as possible while staying on the ground, using any straight-leg or bent-leg technique, with one of the fastest gaits being a "creep" or "crawl" having very much the look and feel of jogging or endurance running — but always while maintaining contact, which makes it a legitimate walking gait! Race walkers like Jeff are the high stylists or technicians (in the sense of "technique" rather than tools or technology), with the 1996 definition requiring them to meet a strict "leg-straightening" rule that makes their style very classic and distinctive; breaking that style can result in a walker’s disqualification (DQ or DSQ). Similarly, freestyle swimmers use almost any stroke or style in order to go as fast as possible, with the crawl stroke generally considered the fastest. Breaststroke swimmers, like race walkers, in contrast, are the high stylists, with a strict form rule to keep them within the required technique. Just as in swimming it’s easier to go fast with the freestyle crawl than with the elegant breaststroke, so in walking at many levels of fitness and skill, the freestyle creep or crawl is highly competitive in a race with the more exacting art of legal race walking. Freestyle walkers learn and use race walking or "heel-and-toe" techniques also, but often in an easygoing and relaxed interpretation where the knee tends to be "relatively" or "significantly" straightened, with allkinds of variations (like landing on a slightly bent knee and "pretty much straightening out" by midstance, near the vertical position). For a dedicated race walker like Jeff, Dave McGovern, or Bonnie Stein, "straight is straight, and bent is bent": keeping the knee straight during each step from a brief moment after contact "until the vertical upright position" is the emblem and essence of a true athletic walker at any speed. Leaving the ground for a very brief period isn’t so important, a kind of artistic liberty earned by the race walker skilled enough to stay in form and reach the velocity where a flight phase can occur! For freestyle walkers, the emblem of legality is "true double support," the moment when the leading foot makes contact and the rear foot still hasn’t left the ground. A straight or bent knee is simply a matter of style or individual biomechanics: but a flight phase would contradict the very concept of being a walker — or, at least, being a freestyle walker. Personally I regard freestyle walking and race walking, like freestyle and the breaststroke in swimming, as two sides of one discipline. Jeff might consider them really different "sports," since the worldviews on what an "athletic walker" is are often so disparate. But let’s move to my proposal for walking events at the Olympics. The current race walking events under the 1996 rules, "straightened leg" and all, should stay: with full gender equality, that means races at 20 km and 50 km for men and women, or four events so far. Seconding a proposal of Alain Moulinet, I advocate adding 100 km freestyle walks for women and men, based on the contact rule only (1949 IAAF walking rules) — or a grand total of six walking events in all. Of course, these race walking and freestyle events can and should take place in other venues at all kinds of shorter distances also! As to Froude’s Law, of course I’m in favor of breaking the Froude barrier, as race walkers and freestyle walkers routinely do while maintaining good contact, just as astronauts and cosmonauts don’t regard the sound barrier as their speed limit! By the l880’s, 7 mph (11.3 km/h) or an 8:34 pace per mile was the benchmark for a serious contender in the UK or USA. The American John Meagher in 1882 set a record for 8 miles of 58:37, at 8.2 mph or 13.2 km/h — a 7:20 mile pace! As Jeff and I have noted, race walkers have been videotaped at 14.6 km/h or 9.1 mph, a 6:35 pace, with flawless contact. There are speculations that humans may be able to go as fast as Froude number 3 with continuous contact — about 19 km/h or 12 mph, a 5-minute mile! Whether straight-leg or bent-leg techniques will be faster, experience will teach us. This is an exciting area where we’re all still learning! In this sense, really fast race walkers and freestyle walkers who maintain good contact are doing a "run/walk hybrid gait," in contrast to a natural walking gait with its familiar "inverted pendulum" motion where potential and kinetic energy are out of phase. Does that mean we should slow down? — of course not: warp speed ahead! All it means is that race walkers and freestyle walkers are in the same hybrid biomechanical boat, and should honor each other’s techniques even while agreeing to differ about rules and styles. Let’s get down to Jeff’s issue of limited resources for race walking. Whatever else may be true, the 1996 straightened-leg rule makes race walking much more of a "gaited community" in the exclusive sense than freestyle walking: the price of admission is much higher! Similarly, many more runners compete in road races or track and field events generally than in hurdles, where just completing the course is a special achievement in itself. 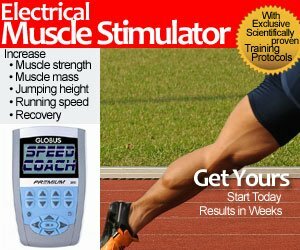 The best solution for race walking, and in fact the best way to keep its straightened-leg rule uncompromised, is to have a thriving freestyle walking community or sister "sport" where walkers who don’t wish to or can’t hack this leg rule can compete "as they are," justlike runners who don’t have the talent or inclination to do hurdles. And just as running races with and without hurdles have equal status as valid athletic events, so race walking and freestyle walking eventsshould have equal status at the Olympics and other IAAF and USATF venues. This solution may bring two dramatic benefits to race walking. First, it permits an alliance with a far larger base of walkers who want to race and try all kinds of gaits and techniques, but without the exacting factor of the straightened-leg rule. We deeply respect the talent, dedication, and training required to overcome this technical "hurdle," and would be honored to help support and advance the goalsof the smaller race walking community — if the relationship is symbiotic, with equal recognition and respect among athletes. Secondly, we know that Masters race walkers (over the age of 35), and especially those over 60, often encounter physical challenges making it difficult to comply with the 1996 leg rule. Many judges are reluctant to DQ people who are courageously trying their best to compete despite osteoarthritis or other conditions. If the struggle to remain within strict form seems no longer so tenable or rewarding, freestyle competition with its equal athletic status provides a ready solution: as long as you can walk and maintain contact, you can compete with whatever styles and techniques you choose! Many of us know the saying about the difference between a jogger and a runner: an entry form! With sanctioned IAAF and USATF freestyle walking events, the same difference will hold between a fitness walker and a competing athletic walker: an entry form. Some freestyle walkers, in learning heel-and-toe as one of their gaits (I recommend it as the best starting point), may take an interest in race walking with its more precise and exacting technique. In the UK, the Race Walking Association (RWA) has achieved a similar result by recognizing both "Category A" races under the 1996 rules, and "Category B" races where only the contact rule applies. As might be guessed, the "B" races have attracted a very lively club scene! How to achieve the same result in the USA is something that race walkers and freestyle walkers need to address in open dialogue. Once it is agreed that we are all athletic walkers, a mutually sustaining structure of trust and cooperation can develop in its own way. Given the mixed feelings that freestylers have about flight phases, and race walkers about fast creeping, maybe two coordinate organizations would be best. In searching out elite freestyle walkers of international caliber, we should look both to race walkers, and also to distance and especially ultramarathon runners whose styles often involve little if any flight phase, and so are at least on the verge of becoming legal walkers under the 1949 IAAF rules! Phil Howell has observed "running walkers" in this intriguing category <http://www.eracewalk.com/PlusType.htm>.Some endurance runners at least coming close to continuous contact have achieved world-class status, as with Paige Higgins in Berlin (2009) <http://www.youtube.com/watch?v=Dazxj7RZiZk>. Returning to Jeff’s concerns about technology, a mutually supportive community or bicommunal alliance of race walkers and freestyle walkers should be able to furnish video and other technologies to athletic clubs and organizations in all countries! In fact, without the availability of video analysis for athletes to study and perfect their gait cycles, whether under the more lenient 1996 contact rule of race walking or the stricter freestyle rule calling for true double support, there’s no level playing field! In freestyle, the 1949 IAAF rules tell us what athletes must aim for and judges assess (a double support phase), while leaving it open whether judges will rely on the human eye alone or bring into play technologies such as video or shoe devices. Video should be used as it becomes practical for a given venue, just as Galileo, 400 years ago, made the telescope a powerful assistant to the trained human eye. If video is affordable for training purposes, then it should be affordable for judging as well. While accessible video technologies are new, the idea of using photography to help assess legal walking goes back 120 years. In April of 1893, Malcolm Ford published an article on "Walking" with an illustration of "A Walker Skipping." As Ford explained: "Both feet are about an inch off the ground, and no better detector of unfair walking can be found than the instantaneous photography by which this illustration was procured." With all our video and Internet capabilities, let’s use the tools at hand! Jeff is right that judges, whether relying only on their eyes or assisted also by video replays, cannot monitor every gait cycle of every walker in a race. With the human eye or video, we use some kind of sampling, random or otherwise (e.g. start, finish, turns, and aid stations where walkers tend to take liberties), and use the availabledata to reach the most accurate and fair decisions we can. With or without video to assist judges, athletes and coaches can do much to reduce the flight phase problem (since double support is required in freestyle) by proper training. This means that if a video study shows "only one frame" in the air, we refine technique or (last resort) slow down until that becomes zero frames! People can still go over the line in the excitement of a race, but often tend to walk in competition as they trained. Freestylers using race walking techniques may find that a bit of fine-tuned knee flexion helps to maintain good contact while going faster. Aiming for a true double support phase is a big step toward achieving it in a race. It’s true that we won’t know the standings until after the finish, when the raw times have been adjusted by adding any tariffs for technical faults. Likewise, we may recall how in the men’s 20 km walk at the Sydney Olympics in 2000, Bernardo Segura Rivera of Mexico crossed the finish line and received congratulations on his gold medal from Mexico’s President Ernesto Zedillo, only then to learn that he had been disqualified! Let’s reenact the famous women’s 20 km walk, also at Sydney in 2000 — with tariffs in place. When Italy’s Elisabetta Perrone got her third red card near the end of the race, a judge or judge’s assistant would have motioned her aside and had her don a bright and easily visible bib or other garment letting other walkers know that she was under a substantial tariff, and no longer "the woman to beat"! Three red cards from different judges should each be worth at least 2% of the world record for the event. Say it was 1:25:00 or 85 minutes: that would mean a tariff of 5:06. Jane Saville of Australia would have had little reason to chase after Perrone, and might have triumphantly reached the finish without receiving her own third card for loss of contact. As it was, Saville’s great emotion but generous and sporting behavior upon receiving her DQ recall Andrew Marvell: "She nothing common did or mean, Upon that memorable scene." Jeff is correct that tariffs do make it harder precisely to judge how walkers stand in relation to each other at a given point in the race. This will doubtless alter race strategies, possibly for the better. Athletes may take an attitude more like that expressed by an African runner: "I am not competing against you: we are all competing against this marathon." That is hardly "chaos," only a different and possibly more noble way of looking at things. Finally, with Alain Moulinet, I agree that a 100 km freestyle walk is ideal for the Olympics, permitting a new and epic scale of competition fitting with the themes of "faster" and "farther," and presenting a not so unfamiliar distance for ultrawalkers and also ultrarunners of various stripes. The latter often favor an "ultrarunner’s shuffle" that can maintain continuous contact with little if any alteration. The variety of gaits and techniques, with race walking emphatically included, should present a fascinating contrast to the 20 km and 50 km walks with their more familiar and classic technique. Centurion organizations (whose members walk 100 miles in 24 hours) may be eager to field contenders! However, this does not mean that freestyle walks in other venues must be at this distance, any more than race walks must be 20 km or 50 km. I’m in favor of events at distances from 100m to 100 km and beyond! In short, to borrow from that African marathon runner: we athletic walkers are all competing to sustain and expand our discipline in its many beautiful forms, and to build structures of mutual trust and cooperation between race walkers and freestyle walkers as equal partners in the race for excellence. Now it’s your turn to speak! A great discussion until the topic of “freestle walking”. (By the way, the term actually already refers to an entirely different endeavor, not to racewalking with limit rules. See http://en.wikipedia.org/wiki/Freestyle_walking ). Without rules, the fastest way to “walk” is to run. Although still imperfect, the rules of racewalking allow for fair competition, but also allow athletes to be athletes. Racewalking at the highest level is not limited by the rules but by physiology. Athletes are going as fast as they can within the limitations of the technique, just as breast-strokers or butterfly swimmers are maxed out physiologically. Walking without rules (“Freestyle” walking”) already exists. It’s called running. Thank you, Dave, for joining in on this discussion! By the way, I’d love to meet you in person and join the “I Was Lapped By Dave McGovern” club. In a nutshell, “freestyle walking” as used in a track and field context means a walking race where the “limit rule” of unbroken contact with the ground applies, as well as the usual footracing rules that apply to running events also; but no additional form rule such as the straightened-leg rule of racewalking limits the range of legal walking techniques and styles. In freestyle, to paraphrase the liberated slave and great Roman playwright Terence, “Nothing that maintains continuous contact with the ground is alien to me.” Everyday walking, a fast bent-knee shuffle, a “near-racewalk” with a bit of noticeable knee flexion in early stance, or legal racewalking — you name it, it’s legal, as long as “unbroken contact with the ground is maintained. At each step, the advancing foot of the walker must make contact with the ground before the rear foot leaves the ground” (1949 IAAF walking rules). It’s that simple, for novices or world-class racewalkers! Maybe the issue you’re raising is mainly semantic: is “freestyle walking” a good name for this event? In my view, as they might say at Wikipedia, this athletic usage isn’t too hard to disambiguate from the sport of emulating skateboard tricks like leaps (with obvious loss of contact)! Likewise, “football” can mean soccer (also “association football”); the gridiron game played in the U.S.A., as at the Super Bowl; or Canadian football, another gridiron version. We could also call it “freestyle athletic walking,” by analogy to the French or Spanish “athletic walk” as the usual term for racewalking. Or we could say “Contact Rule Only” or something else. I actually do believe “Freestyle Walking” is the perfect term for what you’re describing. The only problem I have with it is that it’s already taken! When describing “no-rules” walking in races I often have to resort to calling it “normal” walking or “regular” walking, which implies that Olympic racewalking is NOT normal, so obviously a better term is needed. In freestyle swimming any stroke may be used. In “freestyle walking” this is not the case. (Athletes may not run.) The closest corollary in track & field to freestyle swimming is 19th Century Pedestrianism where athletes could walk or run. What you’re describing is not the same, since running is not permitted, but since the name “freestyle walking” is already taken (and not entirely accurate since running is not permitted, so it’s not truly “freestyle”) then perhaps a return to the term “pedestrianism” even though nowadays running is not permitted? Thanks, Dave, for clarifying the semantic issue you’re raising here about the word “freestyle”! If we’re agreed on the substance of this event type, then whether it gets called “Open Walking,” “General Walking,” “Contact Rule Only Walking,” or something else is not so critical. Personally, I’d love to take you up on your idea and call it “Fair Toe and Heel Pedestrianism,” which was a way 150 years ago of saying that some part of the rear foot (usually the toe) must stay in contact with the ground until some part of the leading foot (usually the heel) makes contact. Maybe “General Walking” would be a good choice: included in this overall genus of walking as defined by the contact rule is the species of racewalking with its additional straightened-leg rule. A philosopher or biologist might say “Generic Walking,” but that could sound a bit stilted. “Everyday walking” may be a good term to describe a usual human walking gait, with racewalking and various other gaits also legal in this kind of “contact rule only” event. A novice can start with everyday walking, gradually building up endurance and a bit of speed. The arm swing, ankle flexion, and heel-through-toe roll are easy to add, and maybe a bit of hip action too at this early stage. Somewhere around 7.2 km/h or 4.5 mph, say a 13-14 minute per mile pace, people may tend to shift to a bent-knee shuffle, and that may eventually get them up to around 10 km/h or 6 mph, a 10-minute pace. To go much beyond that, and stay on the ground, they’ll probably have to really “get hip” and delve deeper into some kind of racewalking or near-racewalking. At each step, they can compete in races and not worry about being legal, as long as they stay within their technique and maintain contact! Dr. Steven Jonas was already mapping out this kind of approach in the late 1980’s and early 1990’s with his two PaceWalking gaits (basic heel-through-toe walking introducing some rudiments of racewalking, and a “race gait” he describes as “jogging with one foot always on the ground”) and his invitation for readers who want to go beyond a 10-11 minute pace to explore advanced racewalking. In short, if we’re agreed on the validity of a new “Contact Rule Only” type of walking event, then coming up with the best name for it can be part of the celebration. The bottom line is that it’s possible to run OR walk and maintain continuous ground contact, or not. The sport of competitive running doesn’t care what you do. The sport of competitive race walking allows discontinuous ground contact. Other events, run or walk, insist on continuous ground contact. (1) Continuous contact vs. flight phase, the classical or “spatiotemporal” definition. (2) Out-of-phase vs. in-phase relationship of potential and kinetic energy, the “dynamical” definition. The basic idea is a contrast between the “out-of-phase” or “inverted pendulum” action of ordinary walking, where our body’s center of mass is highest at midstance when the support leg is vertical, and then falls forward under gravity; and the “in-phase” or spring-like propulsion of running where the body center of mass is lowest at midstance and then bounces up like a pogo stick. (3) Extended or straightened leg vs. flexed or bent leg, the “kinematic” definition where a relatively extended leg is typical of walking and a flexed leg typical of running. A legal freestyle walker, when doing a bent-knee shuffle, is a walker by (1), but a runner by (2) and (3). A legal racewalker, when flight-phasing, is a walker by (3), but a runner by (1) and (2). Someone strolling along at 5 km/h or 3 mph, a 20 minute per mile pace, is generally a walker by all three tests. I was a very enthusiastic supporter of racewalking (racer, judge, race director, club president, U.S. Racewalking Journal co-editor, Web site creator, 1996 Olympics lap counter, Race Walking Record contributor, … ) until I realized that I had to slow down dramatically to keep my knees straight (no matter how much I trained). I then realized that I would much prefer to walk fast (maintaining contact but ignoring the knees) than to participate in the sport of racewalking (a.k.a. race walking). I would love to participate in “freestyle walking” or the UK “Category B” events, but the U.S. purists will have none of it. So I have moved BEYOND racewalking, am having a blast walking fast in long-distance events (at age 70), and am in the final stages of deciding when to pull the plug on my last connection to the sport — http://www.eracewalk.com. 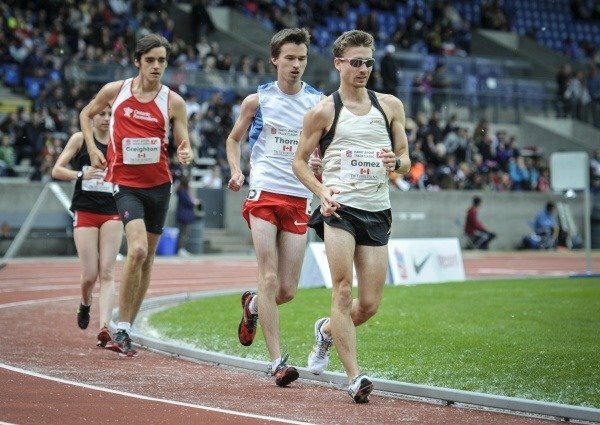 I am a true believer in the value of walking (over running), but I am tired of the never-ending technical debates among the racewalking diehards, and no longer worry about when (not if) the Olympics will drop racewalking in favor of a more commercially appealing sports like dirt bike aerobatics. C’est la vie. Thank you, Phil, for capturing in a few sentences what freestyle walking is all about! I would add a few other comments. 1. In my experience, the “bent knee” rule is only needed to judge the legality of the very fastest racewalkers (many of whom I have “shadow” judged); the vast majority of racewalkers can be judged solely by the “loss of contact” rule. 2. In my experience, many (if not most) local judges are not experienced enough to judge the very fastest racewalkers — or they are often afraid to make a “loss of contact” call on the fastest racewalkers for fear of looking (you supply the word). 4. I enjoyed a 5K racewalk in the Masters Track and Field Championship in San Jose years ago — when someone lapped me almost 5 times in 12.5 laps. Surely the judges used different skills in observing the two of us. From my experience as a judge, I see no reason why different racers (e.g., Category A and Category B) can not be judged differently based, for example, on number bibs having different colors. I recognize you could not judge by different standards if there are 500+ participants in a road racewalk, but let’s get real.